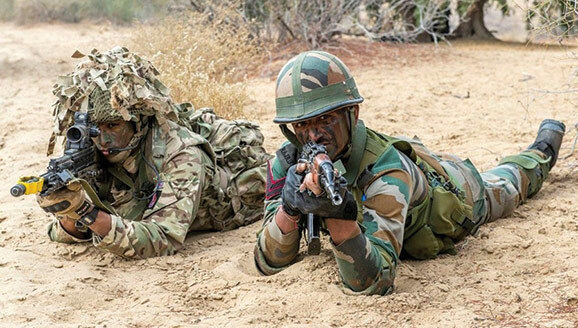 This year’s exercise was held in December at the Mahajan Ranges, in Rajasthan, and involved the 20th Battalion of the Rajputana Rifles and the 1st Battalion the Royal Anglian Regiment (aka the Vikings). Company Commander of B (Suffolk) Company of the Vikings said: “Exercise Ajeya Warrior has been a unique and hugely beneficial experience for us. The hospitality shown by our friends in the Indian Army has been first class, and we are very grateful for the opportunity to work so closely together. The UK and India hold bilateral exercises across all three services: the Royal Navy and Indian Navy partake in Exercise KONKAN which occurs annually in alternate locations, while the Royal Airforce and Indian Airforce partake in Exercise INDRADANUSH every two years, again in alternate locations.